Use machine learning and Oracle Business Intelligence Enterprise Edition (OBIEE) as a comprehensive BI solution. This book follows a when-to, why-to, and how-to approach to explain the key steps involved in utilizing the artificial intelligence components now available for a successful OBIEE implementation. Oracle Business Intelligence with Machine Learning covers various technologies including using Oracle OBIEE, R Enterprise, Spatial Maps, and machine learning for advanced visualization and analytics. The machine learning material focuses on learning representations of input data suitable for a given prediction problem. This book focuses on the practical aspects of implementing machine learning solutions using the rich Oracle BI ecosystem. The primary objective of this book is to bridge the gap between the academic state-of-the-art and the industry state-of-the-practice by introducing you to machine learning with OBIEE. 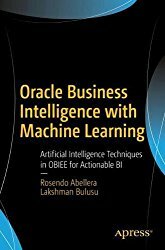 What You Will Learn See machine learning in OBIEE Master the fundamentals of machine learning and how it pertains to BI and advanced analytics Gain an introduction to Oracle R EnterpriseDiscover the practical considerations of implementing machine learning with OBIEEWho This Book Is ForAnalytics managers, BI architects and developers, and data scientists.